Preston Gilbert, a faculty member at the SUNY College of Environmental Science and Forestry (ESF) in Syracuse, N.Y., has been awarded a Presidential Fellowship by The Research Foundation for The State University of New York (RF). The RF's Presidential Fellowship Program provides a core support system to the SUNY Networks of Excellence and a unique opportunity for faculty to influence and actively pursue SUNY's research agenda. Gilbert's fellowship, one of only six awarded by the RF, will support his work in designing and implementing the New Forest Economy initiative developed at ESF. The initiative is an economic development strategy and international network that focuses on devising ways for former paper mills and wood products facilities, and the wood fiber that was used in them, to meet the needs of existing and developing markets. "From 1998 to 2012 New York state lost a third of its paper-making facilities and is likely to lose more over the next 20 years," Gilbert said. "The New Forest Economy project puts these facilities to use, taking advantage of the hundreds of millions of dollars of public and private investment that developed our natural resource-based industrial infrastructure." The fellowship program, administered by the RF, focuses on advancing programs to increase research, collaboration and human capital development; enhancing SUNY's research profile and the honoree's scientific career and leadership abilities; and developing faculty perspectives on a broad range of issues. The fellowship provides support such as release time funded by the Research Foundation, salary supplements, sabbatical leaves and summer employment. "Congratulations to Dr. Gilbert on his fellowship appointment," said Dr. Tim Killeen, the RF president. "Preston's recognized expertise and collaborative vision are essential components that build the Networks of Excellence framework. 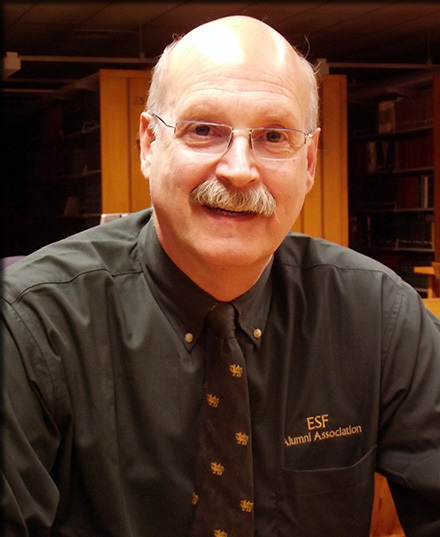 We are grateful for his commitment and to our colleagues at ESF for this most valuable resource." Projects involved in the New Forest Economy initially will be located in New York at Lyons Falls, Wellsville, Cattaraugus County and Morrisville. The project could eventually touch as many as 20 facilities across the northeastern United States and more than 30 nationally. The New Forest Economy was conceived by Gilbert, a senior research associate in ESF's Department of Landscape Architecture (LA), in partnership with Dr. Thomas Amidon of the Department of Paper and Bioprocess Engineering, with leadership involvement from Dr. Timothy Volk of the Department of Forest and Natural Resources Management and Associate Professor Emanuel Carter of LA. The starting point of this effort is New York state's large and growing forest resource and the increased biomass availability flowing from the biomass willow program at ESF that is conducted by Volk and his colleagues. The central process in the New Forest Economy project uses a clean biotechnology process, called hot water extraction, developed by Amidon with co-workers and students at ESF. The process systematically disassembles wood fiber in an environmentally friendly way and uses the wood's components, such as cellulose and hemicellulosic sugars, to fabricate dozens of valuable bioproducts. The integrated process and associated secondary industries result in enhanced produce for human consumption; wood products; biochemicals; compostable and biodegradable plastics; food additives such as acetic acid and vanillin; pharmaceuticals; nanocrystalline cellulose; and energy products such as wood pellets and liquid fuels. Gilbert will work with Amidon, Volk and other faculty members and researchers at ESF and SUNY's Alfred State and Morrisville to extend the initiative to other SUNY campuses and weave the New Forest Economy into the development of Start-Up NY sites statewide. Start-Up NY is the plan announced by Gov. Andrew Cuomo last year that creates tax-free zones on SUNY campuses and other university communities to nurture new and developing business enterprises. The New Forest Economy has received leadership funding support from the National Science Foundation, the New York State Energy and Research Development Authority, the U.S. Department of Energy and private industry. Gilbert provides the economic development leadership while Amidon and Volk provide technical leadership. In addition to implementing the New Forest Economy in New York state, Gilbert will provide the leadership through ESF to engage Youngstown State University of Ohio, the University of Wisconsin at Stevens Point, the University of Minnesota at Duluth and Washington State University as well as Cardiff University in Wales and universities in China and Brazil in a global implementation program.